Replay Video Capture makes it easy to capture ANYTHING you can watch on your PC's screen as a production-quality video. It's the best way to make professional-looking videos from hard-to-capture web sites, DVD's, webcams, chat sites. Replay Video Capture includes a proprietary MPEG-2 codec which provides unparallelled picture quality while not slowing down your CPU. Setting up a recording is quick and convenient, and the results are amazing. Make High Quality Video Record and Capture from ANYTHING Playing on Your PC. ...... lose video frames or get choppy audio. These are preferred for high-motion video, or for use on slower PC's. For the audio track, Replay Video Capture captures what you hear from your PC's speakers by default. Or, you can choose to narrate using the microphone instead, which is great for PowerPoint presentations and software demos. 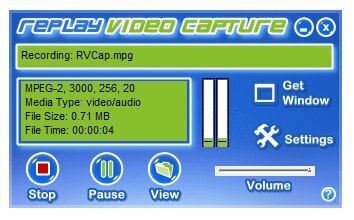 Using Replay Video Capture is easy. Use the Get Window option to locate the video window (or mark it manually), then click Record to start. With Replay Video Capture, you'll get amazing video quality, or compact portable files. You can choose between high-quality, high-speed MPEG-2 files, or smaller Windows Media (WMV) files. Qweas is providing links to Replay Video Capture 4.2 as a courtesy, and makes no representations regarding Replay Video Capture or any other applications or any information related thereto. Any questions, complaints or claims regarding this application Replay Video Capture 4.2 must be directed to the appropriate software vendor. You may click the publisher link of Replay Video Capture on the top of this page to get more details about the vendor.